Rex Ellis has been an Outback guide for fifty years, establishing his safari operations In late 1965. Prior to that he worked on Outback stations in South and Wes,tern Australia, as a Jackeroo, Station Overseer, and as a fencing contractor. His nature orientated safaris observed the conservation ethic years before the term ‘ecotours’ was coined. As Australias longest operating Outback guide, there are many ‘firsts’ to his credit. These include early 4wd safaris to Cape York Peninsula from 1969 onwards. Operating the first commercial 4wd crossing of the Simpson Desert in 1971. From 1966 onwards he operated 4wd trips on the Oodnadatta, Birdsville, and Strzelecki tracks, as well as the Nullarbor Gt. Australian Bight coastline, Western deserts, Kimberley and Gulf country. For years he maintained a small ‘depot’ in the Gt. 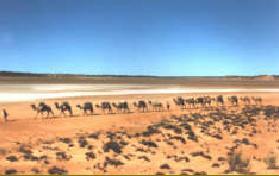 Victoria desert, near Neale Junction, creating an artificial watering point in a waterless region. This enabled him to show that Budgerigars (in particular), in a good season, could raise up to six broods every six weeks. Getting their only moisture intake from feeding almost exclusively on green Spinifex seed. Not once did they access the rainwater (available in a trough) on hand. He ran the first of his many Desert boat safaris in the Eyre creek (Eastern Simpson Desert) in 1972, after accessing all Lakes in the Coongie system in the late 1960’s. In1973 he purchased the Birdsville Pub, owning it for six years, and using it as a base for operating 4wd safaris to Lake Muncooney ( when it had water) in the Simpson Desert, using a six wheel drive converted ex army Studebaker truck for the operation. During the massive record inland flooding of 1974, he took a smallboat party down the Warburton river, before making the only crossing ever of Lake Eyre, from north to South. In 1976 he began pioneering long haul camel expeditions in all Australian deserts (up to 45 days duration). Since 1974, has operated twenty eight boat safaris down the flooding Warburton, three ‘round’ trips (750Km) down the Kallakoopah Creek (the Simpson Desert annabranch of the Warburton , that only runs when Warburton a very high river). Plus 12 trips down the Cooper River to Lake Eyre since 1974, and three trips up the Cooper to Lake Hope and beyond. Also other outback rivers such as Eyre Creek , Diamantina, Bulloo, and Paroo. He owns and operates a paddlewheeler (The P.W.Dromedary) and operated on the Darling River from 2013 & 2015. Lifting it by crane to get around Menindie Weir, managed to get to Wilcannia in 2014, the first paddlewheeler there for nearly 80 years. He has written 10 books including a recent novel, ‘No Roads To Darwin’. The tenth book is Dromedary Dreaming and a recently updated map of The Australian Deserts. Rex Ellis's Bush Safari reserves the right to cancel or alter itineraries without notice.